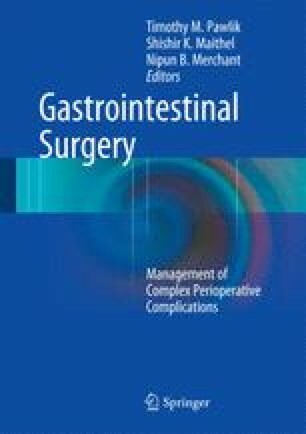 Advances in operative technique and perioperative care have driven mortality following pancreaticoduodenectomy to historic lows, but morbidity remains 30–50 %. A majority of this morbidity is a result of disruptions of the pancreatic anastomosis. Major disruptions of the pancreatic anastomosis (International Study Group on Pancreatic Fistula (ISGPF) grade C leaks; see below) are rare events accounting for 3–5 % of all pancreatic fistulae. Mortality following grade C leaks has been reported to be as high as 25 %, so avoidance is paramount and requires adherence to principles of a tension-free, well-vascularized anastomosis. Options for management include percutaneous or open drainage, repair, or revision of the anastomosis versus completion pancreatectomy. Major disruptions are challenging to manage, requiring careful handling of profound physiologic derangements, control of pancreatic secretions, and aggressive nutritional support.